China beat Nigeria 1-0 while Brazil beat Italy 2-1 at the 700 Year Anniversary Stadium in the first two matches in Group B of the FIFA U-19 Women’s World Championship on November 10. 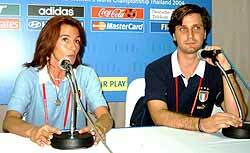 Elisabetta Bavagnoli, Italian coach (left) after Italy lost to Brazil 2-1. In the first match between Nigeria and China, the first half ended with neither side able to score. However, Zhang Ying, the Chinese No 8 scored the only goal of the match in the 80th minute and China picked up three points from this match. The second match was between Brazil and Italy. Brazil’s outstanding players, No 7 Kelly and No 10 Marta, proved skilful, and in the 16th minute of the first half, Brazil managed to take the lead as Italy’s No 3 while trying to block the ball, scored an own goal. Brazilian coach, Ferreira Luiz (right) at the press conference after Brazil defeated Italy 2-1. In the 65th minute, Ricco Agnese, Italy’s No 9, equalized. The Brazilian team retaliated with another goal off the boot of Kelly, in the 86th minute, with the match ending 2-1 in Brazil’s favor. At the press conference afterwards, Brazilian coach Ferreira Luiz said he expected the players to score at least three goals, but they were unable because the Italian players were very strong and skillful. He admitted that the Italian defenders were excellent. He expected a better performance and more goals from his players in the next matches, he said. Italian coach Elisabetta Bavagnoli said her players had been pitted against the strongest team in the world, so being defeated 2-1 was a good performance by her team and she was satisfied. She was confident that Italy could easily beat China and Nigeria as her players’ nervousness had been reduced after the match against Brazil. One of the wonderful aspects of being married to the Thailand cricket coach is that you get to drive him to the airport at such unearthly hours at 6 a.m. on a Saturday morning! It was worth it though. Watching the boys who had been chosen to play for Thailand arriving at the airport (for some, their very first flight), very proud in their cricket whites and with the biggest grins on their faces. Khun Parn, the chairman had at least 50 bags of home-made crisps in a big plastic bag - well the journey did take 50 minutes, they were bound to be hungry before then! The wonderful thing about Thai children is that nothing seems to faze them. Apparently arriving at the Bangkok Polo Club to play their first practice game was all in a days work, and as for Sunday at The Harrovian School, well they could have been pupils arriving for a cricket game! The first couple of overs on a grass wicket were a bit daunting, but they soon got into their stride and put on a good performance. The boys are in Bangkok practicing for the Jaafar Cup Tournament to be held from December 9-12, 2004. They will be playing against Singapore, Malaysia and Hong Kong. Students at Grace International School competed in an intramural 3-on-3-basketball tournament. Sixteen teams faced off in the double elimination Tiger Tip-off series. DTACL +B, the champion team of the Grace 3-on-3 tournament holding the Tiger Tip-off trophy. (Clockwise) David Fain, Luke Fain, Daniel Bangcong, Angela Witmore, Tessa Shockey, Caleb Melancon, and referee Walt DeMoss holding the score card. Rick Favazza, the event organizer, encouraged students from grades 7-12 as well as adults and teachers to participate by forming teams. The purpose of the event was to encourage sportsmanship and school spirit, while giving students the chance to have fun and compete. The tournament turned into a community event as parents, teachers, friends and students came together, ate hamburgers and enjoyed the competition. 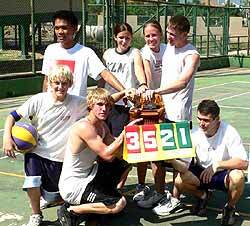 Teams fielded three players on the court at a time but could have up to six people on their team. One of the qualifications was that a girl had to be on the court at all times. 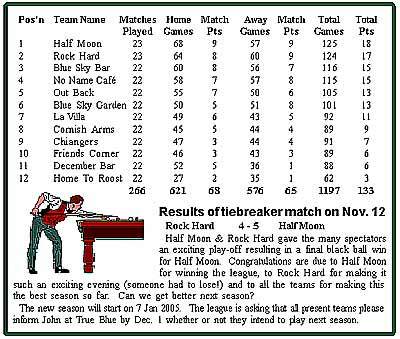 The tournament started on a Friday night and ended Saturday around noon. The makeup of the teams varied from all students, to a mix of students and teachers, or students and parents. One team was composed of mothers. The championship game featured the Hot Dogs: Matt Kramm, Jake Harbold, Desiree Macmillan, and Marissa Ukosakul against DTACL + B: David Fain, Tessa Shockey, Angela Witmore, Caleb Melancon, Luke Fain, and Daniel Bangcong. The competition was intense, and emotions were high in this action-packed final game, but DTACL + B came out on top, claiming the win and the trophy. Biking for Education is going ahead, strongly supported by Zonta International Chiang Mai. The fund raising event is for the Chalermprakiat 48 Phansa Girls School in Pasang, Lamphun to generate educational funds for 200 teenage orphaned girls in the school. David Curtz, a Canadian businessman who has lived in Chiang Mai with his family for four years, will ride 1,500 km from Phuket up to Chiang Mai. The Phansa Girls School in Pasang, Lamphun belongs to the long term projects of Zonta International Chiang Mai Club. The school grew from 40 to now over 200 teenage girls. If you are interested in participating or being a part of the good cause, please contact the following Zonta members: President Hope Watcharaprecha tel. 053-262691; Past President Margaret Bhadungzong tel. 053-247083; Ornsri Thammasat tel. 053-510083 or Dittaya Curtz the intrepid long distance cyclist’s wife, tel. 053-838092. For riders interested in joining, please contract David Curtz at [email protected] or call 01 433 4141.